Step 1: Use a wall as a barrier so your dog doesn’t swing out in front of you at first-you are on one side of the dog the barrier on the other. Step 2: do a little warm up of the cue “Touch” (getting your dog to target your hand) in the way you usually do it to get the dog on the right track. Now stand with you hand against your leg at the point where your dog can just reach it without having to jump (img 1). Cue “touch” and click ANY motion towards the hand. Try to feed the dog in the position you desire them to be in(img 2). Stand with your legs together at first, but also stand in many different positions- with a foot pointing out, with a foot pointing behind, crouching, bouncing slightly, shuffling your feet etc, teaching the dog this is the position I want you to be in no matter what my legs are doing (img 3). Step 3: Once your dog is a master at this, try taking a tiny step. Two inches forwards. If the dog scoots forwards click and treat! If your dog can master tiny adjustments it will really fix it in their minds that “this is where I’m supposed to be, head up, glued to your leg”. Step 5: Take a normal step and click the dog for moving with you. Now add steps (img6). If the dog looks down, or lags or is too far out, try to encourage them to return to the hand, and click when they are back in place. If they don’t seem into it try again later, and take less steps. This is hard work, especially because they will be using new muscles than just normal walking and trusting you completely that you won’t walk them into a wall! Do this exercise on flat ground with nothing to trip and stumble over. Practice turning right and left in little increments to begin with. This “trick” can take months even years to perfect, so take it easy, it’s a great exercise for just building focus and understanding. Nice description of the process. Good work. Thank you. I have been catching up on your videos now for the past two weeks, and just received a copy of a Karen Pryor book from the library today, Reaching the Animal Mind. 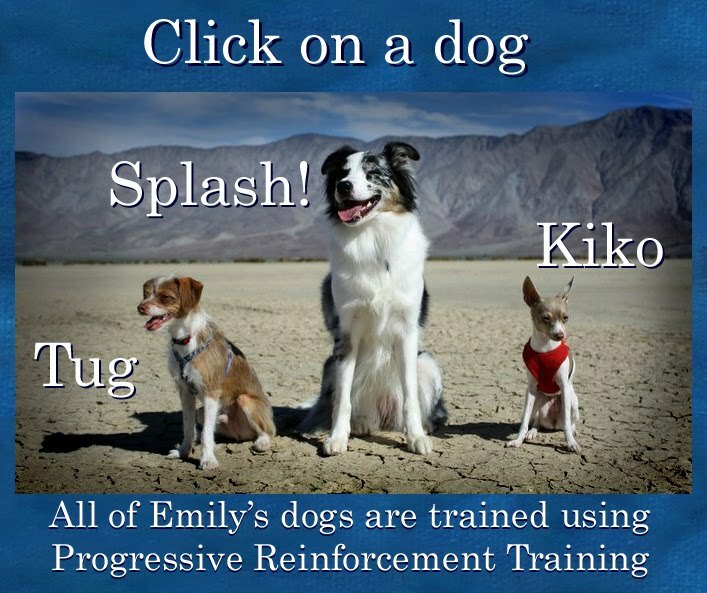 I appreciate your introducing me to Clicker training and your ability to communicate on your training videos. It's great. One question--about choke chains. I thought the point was (from Barbara Wodehouse video's seen years ago) that you 'snapped the collar' to make it click--had nothing to do with tightening the collar around the dog--I thought it was about conditioning as well. If you can comment, I'd love to hear your insight. Thanks again for all of your work.